Whether you are missing the Christmas spirit, looking to brighten up a dull day, or looking to start your spring cleaning early, or if you just love the smell of old books, here is the perfect event for you! A Book Week Bazaar on Sunday, March 9, from 11 AM-3PM at the Primary Campus Hall at the end of the BSB Sanlitun Book Week. So come enjoy browsing books over some tea, coffee and baked goodies. Rummage for treasures at the Roundabout sale. Win a raffle prize! 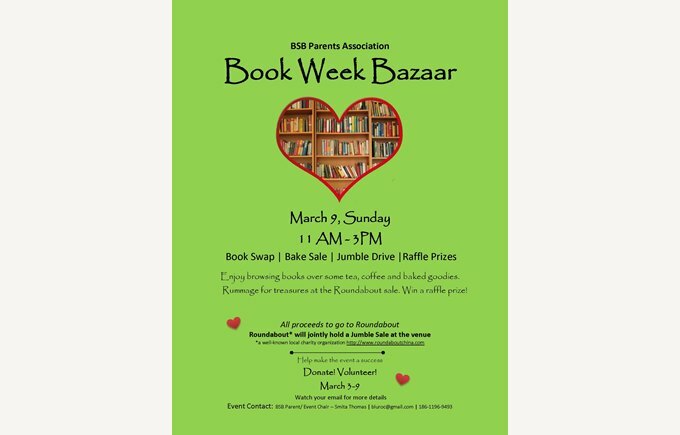 The Bazaar will include a Book Swap, Bake Sale and a Jumble Drive organized by the Parents Association. All proceeds will be donated to Roundabout China -- a well-known charity based in Beijing that provides free service serving as a bridge between donors and worthy charitable causes. Roundabout will also be holding a Jumble Sale at the venue jointly with our Book and Bake Sale.